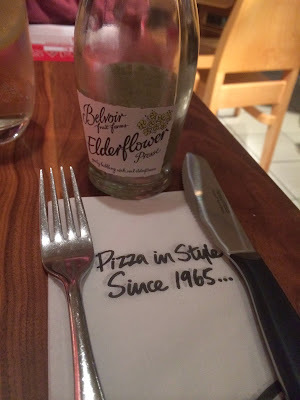 We got invited to try Pizza Expresses new Autumn & Christmas menus recently, so we timed a visit so we could go to our usual Pub Quiz afterwards and went along to the Harborne branch. We set ourselves the restriction of only things that had a 'new' tag on the menu and went to work. It really doesn't hurt that they sell decent soft drinks. This always helps put me in the right mood - some restaurants look down on the non-alcoholic section but it isn't hard to keep us happy. The table of ladies behind us all had the raspberry version of these so a clear headed night out was on many people's cards. First up was this mighty sharing starter. I got the best deal here as the red sauce at the bottom left is a sausage based tapas thing so Ms. NLi10 didn't get to share. 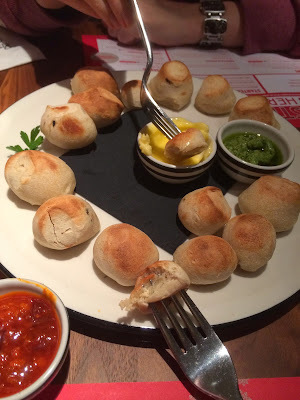 The dough balls were perfectly fluffy and not too filling and the pesto was a nice touch. I really enjoyed the red stuff though ("spicy n’duja sausage & olive oil") and would happily have a main course version of this. "Fennel and chilli sausage, tomato, baby mozzarella, Gran Moravia cheese, basil and extra virgin olive oil." I liked it - it wasn't too spicy (in fact only the meat was spicy) and had some interesting flavours going on. The base was crispy without being hard (while lacking the Zafirellis texture) and the cheese was non-offensive to a cheese hater like myself. Overall this was a good solid choice and one I'd eat again - but there are other exciting things to have so I'd probably continue to explore the new. My partner had the new Calzone Verdure, which she described as "spicier than expected, liked the topping, could have had more cheese". The menu lists it as "Goat’s cheese, chargrilled vegetables, sweet baby onions, spicy arrabbiatta sauce, baby fresh spinach and pesto." While I am a big fan of anything that describes itself as arrabbiatta (personally I think Italian food has my level of spicy nailed to a T), she found it a little too warming (second drink territory) but did really enjoy it. We also had a portion of Polenta chips which turned out to be a bit unnecessary after the starter too, but I did manage to finish them all. 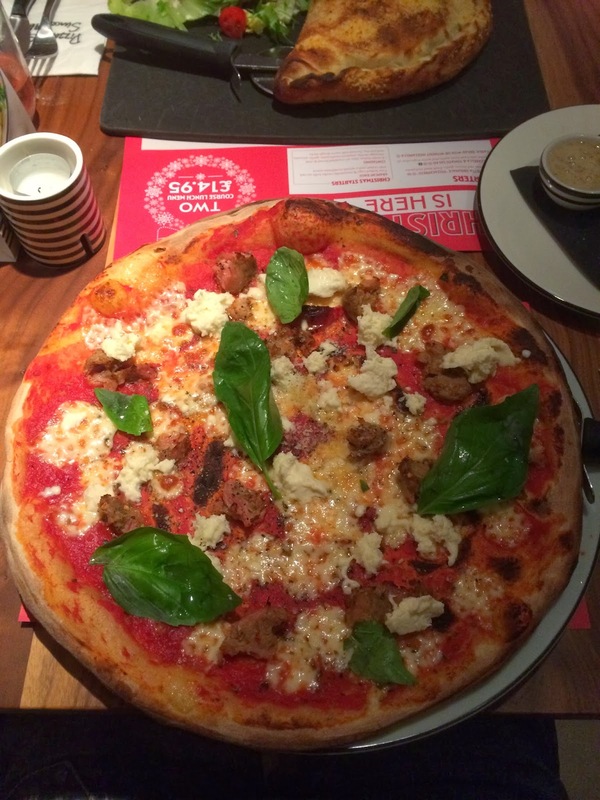 I think that the new options on the menu are a lot more exciting than I'd expected, and I've spotted a lovely sounding Pizza on the Christmas menu which means I'm going back sooner than I would normally have. We ordinarily only eat at Pizza Express when we can't find a nice indy restaurant when we are out and about around the UK, but there are three or four other things on the menu that I want to try so maybe we will treat ourselves a couple more times. Certainly at least once with the Christmas menu's pork & apple pizza! Can't wait for the Christmas pizza review, it sounds amazing! I love those polenta chips, they are seriously moreish.